Mech-Q LT version has recently been updated which now includes fast install and setup. 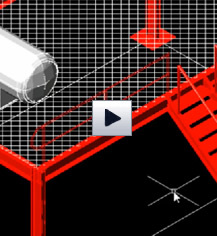 Have a look at our 9 minute video which walks you through how to create steel beams in 3D. The recent July release of IntelliCAD 7.0a this month the provides lots of new stuff. Our First Ever Summer Giveaway!! Now’s your chance to receive a copy of Mech-Q or AViCAD! Simply answer a short 4 question survey and vote for us on Facebook. Only one entry allowed per office. Winners will be chosen randomly. Many prizes are available so be sure to stop by and enter into the drawing. Mech-Q offers four powerful 2D drafting tools which include Piping, Structural, Ducting and Mechanical.